One of the more common questions is whether I recommend any supplements. I recommend very few of them. For longer fasts, I recommend a general multivitamin, although there is scant evidence that it is beneficial. In fact, almost all vitamin supplements have been proven to be useless. In some cases, like vitamin B, worse than useless. All vitamins go through periods of of popularity and unpopularity. It’s worse than high school. One minute, you’re the most popular kid in class, then next you’re the laughingstock. In the 1960’s the king of vitamins was vitamin C. Linus Pauling is the only person to have won two unshared Nobel Prizes – once for chemistry and once for peace. He had the firm unshakeable belief that many of the problems of modern nutrition could be cured by mega doses of vitamin C. He suggested that high dose vitamin C could prevent or cure the common cold, the flu and even cancer. He even suggested that “75% of all cancer can be prevented and cured by vitamin C alone”. That, of course is wildly optimistic. Many studies were done over the next few decades that clearly proved that most of these vitamin C claims were simply false hopes. Turns out the only disease Vitamin C cures is scurvy. Since I don’t treat many 15th century pirates, it’s not too useful for me. Once vitamin C supplementation was proven largely useless to prevent disease, the next great hope was vitamin E. Its main claim to glory was as an ‘antioxidant’. Supposedly, vitamin E would neutralize all the nasty free radicals that were causing untold damage to our vascular system. Taking vitamin E would prevent heart disease, we were told. Except, of course, it did nothing of the sort. The HOPE trial, best remembered now as one of the trials to establish the use of the ACEI class of medication in cardiovascular protection. However, this randomized controlled trial also tested whether vitamin E could prevent disease. Unfortunately, the answer was no. Vitamin E supplements did not prevent heart disease or stroke. 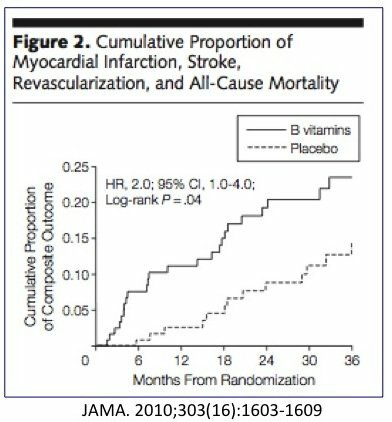 Indeed, more patients in the vitamin group died, had heart attacks and strokes although this was not statistically significant. Vitamin C was a bust, and so was vitamin E. But the list of shame would not stop there. The next great hope was vitamin B. In the early 2000s, there was a great flurry of interest in a blood test called homocysteine. High homocysteine levels were correlated with increased risk of heart disease. Vitamin B could lower homocysteine levels, but whether this would translate into better health outcomes was unknown. Several large scale trials were launched with this hope. One of these was the NORVIT trial, published in 2006 in the prestigious New England Journal of Medicine. The news was stunning. Stunningly bad, that is. Compared to taking placebo (sugar pills), supplementation with folate, vitamin B6 and B12 was giving people more heart attacks and strokes. Yes. The vitamin group was not doing better, it was doing worse. But worse news was still to come, if you can believe it. In 2009, researchers studied the two randomized controlled trials of vitamin B supplementation and found that in addition to raising the risk of cardiovascular disease, the risk of cancer was increased by 21%! Aw snap! The risk of dying from cancer increased by 38%. Taking useless vitamins is one thing, taking vitamins that are actively harmful is something else. The use of vitamin B supplements for kidney disease was similarly dismal. The DIVINe study randomized two groups of patients with chronic kidney disease (CKD) to either placebo or vitamin B supplements with the hope of slowing down the progression of kidney disease. Homocysteine levels are high in CKD and the vitamins were able to lower these levels. But did they make any real difference? Sure did. The use of vitamin B made things worse. Much, much worse. It doubled the incidence of poor outcomes. Another nail in the coffin of the homocysteine story and vitamin B supplements. Another 10 years of research money wasted. The ironic part of this flawed knowledge is that we are still paying the price. Enriched wheat flour, for example is wheat with all the goodness extracted and then certain vitamins replaced. So almost all the vitamins were removed, and replaced with huge doses of iron and vitamin B. So what we got was a huge surplus of vitamin B. Not that I believe this was malicious. People were mostly concerned about nutrient deficiencies like beri beri, iron deficiency anemia and not so much with anything else. The problem, of course, is that we now have data that show that giving large doses of vitamin B may increase rates of cancer and hear attacks. But why should vitamin B supplements be bad? 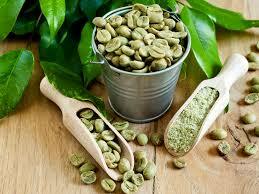 After all, folate supplements have reduced the incidence of neural tube defects in pregnancy significantly. Like everything else in medicine, it’s a question of context. Vitamin B is needed for growth of cells. During growth periods, like pregnancy and childhood, this is a good thing. The problem is completely different during adulthood. Excessive growth is NOT good. The fastest growing cells are cancer cells, so they love, love, love the extra vitamin B. Not so good for us people. Even for regular cells, the excessive growth is not good, because it leads to scarring and fibrosis. This explains how you get more heart attacks, strokes and kidney disease. Cardiovascular disease is caused by atherosclerosis, the hardening of the arteries and excessive fibrosis likely makes it worse. Calcium supplements, of course have been recommended by doctors for decades as a preventative strategy against osteoporosis. I explained everything in this lecture from a few years ago “The Calcium Story“. Almost every doctor has recommended calcium supplements to prevent osteoporosis. Why? The rationale is that bones have lots of calcium so eating calcium must make bones stronger. This is, of course, the reasoning that a third grader might use, but that’s besides the point. Eating brains makes us smarter. Eating kidneys improves kidney function. Right…. But any who, this puerile reasoning lasted for about 50 years. We pretend that we live in a world of evidence based medicine. Just as we discussed with calories, it seems that evidence is not needed for the status quo, but only for ‘alternative viewpoints’. 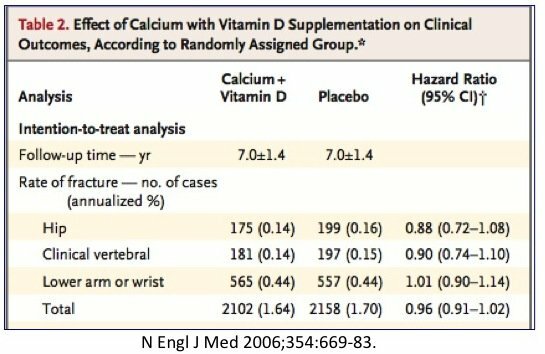 They finally did a proper randomized controlled trial on calcium supplementation and published it in 2006. The Women’s Health Initiative randomized over 36,000 women to calcium and vitamin D or placebo. Then they followed them for over 7 years and monitored them for hip fractures. Did taking calcium every day for 7 years give women super-strong bones that never crack? Hardly. There was no difference in total fractures, hip, vertebral or wrist fractures. In other words, calcium supplements were completely useless. Actually, that’s not true. There was a significant difference. Those people taking calcium had significantly more kidney stones. So, they were actually harmed by taking these pills. Nice. Are these women glad they faithfully took their pills every day for the last 7 years? What is the reason why these supplements are not beneficial and mostly harmful? It’s really quite simple. You must understand the root cause (the aetiology) of disease in order to prescribe rational treatment. The diseases that we face today – obesity, type 2 diabetes, osteoporosis, cancer, heart disease etc. ARE NOT VITAMIN DEFICIENCY DISEASES. If these are not disease caused by a lack of vitamins, why would we expect supplementation to make a difference? Let’s be clear. If you have a vitamin deficient disease (ie. Vitamin B12 deficiency) then yes, you should take vitamins. If you are obese or have heart disease (ie. NOT vitamin deficiency diseases) then you are not likely to benefit. Let’s take an analogy. Suppose our car does not run because the engine has exploded. Somebody then says “Oh, hey, I had a time where our car did not run because it was out of gas. Therefore you should put more gas into the car”. But it doesn’t work. Because you must treat the root cause. The problem was that the engine exploded. I don’t really care how much gas is in the car in this situation. So, if we are treating vitamin deficiency disease (scurvy, beri beri, osteomalacia) then replacing vitamins is very logical and effective. If we are treating obesity, then replacing vitamins is completely and utterly useless. I don’t worry about nutrient density of foods, because I am not treating a nutrient deficiency disease. However, people love trying to sell you the latest greatest weight loss supplement (green coffee, raspberry ketones, PGX, fibre, Sensa etc). If you are asking the question “What can I eat/ take/ supplement to help me lose weight?” then you are completely going in the wrong direction. The question you need to ask is “What can i NOT eat/take/ supplement to help me lose weight?” The money to be made answering the latter question is orders of magnitude smaller than trying to answer the first. If I have low levels of ferritin and vitamin B12, is it not a good idea totake supplements? Vegans and vegetarians get practically 0 vitamin B. I think this is a different case than the populace? I think this article is referencing the excess of vitamins, rather than whether we need them or not at all. Although I wonder what the record for fasting days on water without a multivitamin is. Dr. Greger has a great video on Ferritin you should see…the “normal” level is really, in his estimation iron overload associated with increased risks of many diseases…I donate blood on a regular basis to keep my Ferritin level(s) down below 40. Thanks for mentioning that. Good plan. So it seems that when doctors bled their patients in the olden days, they were doing the right thing. Yes–Dr Fung does say that if you are dealing with a deficiency–then a supplement could be a good idea. If you have low levels of B12, it’s likely tied to low stomach acid. A person cannot absorb B12 very well (if at all), if their stomach acid is low. It is probably a better idea to take a swig of apple cider vinegar before a meal to get the stomach acid juices flowing to help with B12 absorption. I make my own kefir and my B vit levels went normal! If low in anything eat the food that has that nutrient! My husband’s grandmother was always taking weird vitamin cocktails she would make, thinking it was going to keep her healthy, well, she apparently mixed some vitamins and too much iron and landed herself in the ER with congestive heart failure. She’s doing better now, but this is just one case of someone misinformed almost killing themselves to be “healthy” with supplements. Would taking electrolytes (home made or store bought) still be beneficial for people fasting or eating LCHF? Bob, after going low carb I also added salt, magnesium and potassium to my diet. My understanding is that the lower insulin level achieved with low carb and fasting will increase water loss and therefore mineral loss. If so, the minerals have to be replaced. Gerolsteiner is like a mineral supplement. Total dissolved solids >2500. Apollinaris is my second choice. This could be correlation and not causation, but within a couple of days of taking a B supplement (50 mg. ) on physician recommendation, the little and fourth fingers of my left hand went numb. This about six weeks ago. No other reason, seemingly, though it could be ulnar nerve inflammation. Needless to say, I stopped taking that supplement. Fingers still mostly numb. Another great post of common sense and will be attended to! You may have an ulnar nerve issue. If it continues see a neurologist. They can look at your spine, specifically your neck where the brachial plexus originates. Best of luck. What about Vitamin D? We hear so much about not getting enough and I was tested and had very low levels. I do want to thank you for bringing my attention to the B vitamin problem. I did not know and have been taking a B complex for years. That stops today. I’m curious about Dr. Fung’s opinion on vitamin D supplementation as well. I take no pharmaceuticals at all, or supplements, but my doc recommended I take 2000-4000 IUD of vitamin D daily. I’ve made a point to sunbathe more frequently, so hope that does the trick (I’m elderly and of northern European descent). Cynthia, sunbathing is the best source of vitamin D. As long as you are careful to avoid burning, the benefits far outweigh the small risks. Little and often is my way. Those interested in the benefits of the sun are likely to find this article by Dr Kendrick useful. Thank you for the updated review on vitamins. Can you also speak to any evidence about vitamin d? I absolutely love you, Dr. Fung. You make me think and laugh at the same time! Was Dr. Mercola talking about muscle loss during fasting? Or was he talking about muscle loss as we age? BobM, Thank you so much for your research, wisdom, and clarity. 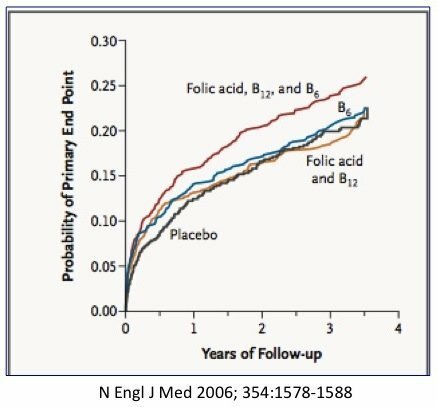 FWIW, one observation that I would like to add to the considerations is that folic acid is the synthetic, that folate is the food sourced form, and, I’ve read from other doctors in the last 2 years (Joel Fuhrman, MD, may have been one), that ingesting folic acid is unsafe. He talks about “taking vitamins for weigth loss/treat obesity” being useless and clearly stated that if you have a deficiency, then taking that vitamin as a supplement makes sense. So if you are vitamin D deficient (like most people), then yes you can supplement. I take Vitamin D, K, C, L-lysine, fish oil, and Astaxanthin daily. What would the name of the lab test be for testing/evaluating a comprehensive vitamin/mineral profile for a person. Is there a “panel” that can be ordered that would clearly show deficits? There have been periods in my life when I consumed large amounts of supplements and other times when I used no supplements. I really could not tell the difference in how I felt. Doing Intermittent Fasting and eating a Low Carb Moderate Protein High Fat diet is more important. What to eat and when to eat within these guidelines depends on individual circumstances. So you need to experiment with the macros and timing a bit. There definitely many moving parts. Protein, fats, carbs, fibre, insulin load, insulin index, energy density, various essential vitamins, essential minerals, cholesterol, saturated fat, ketones, blood sugar, insulin, fasting etc etc etc. Magic bullets that work alone for all people are hard to find. The challenge is to find the right tool or highest priority suite of tools that best suit an individual’s current situation and goals. Initially, this article was VERY disturbing for me! Then I thought about it long and hard! My question was: Am I better off with krill oil as without it? The extensive research on krill oil is compelling, science based, and properly tested! There is NO DOUBT about that!! So, I ask the same question for EVERY other supplement (including Vitamin D and Magnesium) I take! I got the SAME answer! It is about people who are looking for supplements/vitamins thinking it will help them treat obesity. It doesn’t question the utility of supplementation if you are deficient. I won’t change my habits of taking vitamin D in winter and o3 daily based on this article. Burning books. That sounds so progressive and rational. More book burning more book sales. I couldn’t agree more. Not a one size fits all supplements. Some are better than others. As are herbal remedies. With depleted soils & foods that lack fresh quality. Obviously nutrients are lost or altered from cooking or heating. Some supplements are Concentrated foods. Green foods, sprouts, kombucha and various herbs have merits. Aspirin being formulated originally from Frederick Bayer would drink white willow nightly and wanted to offer the benefits of white willow to general public. These studies were likely low doses, under 1 g a day. Government guidelines re: vitamin C is useless, because it’s based on wrong premise. I would hope, the goal is not only to prevent scurvy, but to promote optimal health. Low dose takes care of the former, mega-dose takes care of the latter. You are another courageous worrier against public ignorance. Without having the backup knowledge from such trials like HOPE, NORVIT , WHI etc, I always thought taking vitamin supplements was useless for people, just another way to make money. Thanks for summarizing . Now I know for a fact vitamins there are not only useless but actually harmful! Vitamins are key for our bodies to function properly at the molecular level, cofactors for escential chemical reactions etc., but there is no need to take extra vitamins if we have a varied and balanced diet. .
Has anyone used Berberine or Banaba Leaf for blood sugar control? I grew up in a town whose central plaza was planted with banaba trees. Sure, folks use the infusion of its leaves for various ailments, mostly for kidney complaints. We control blood sugar by not eating sugar (and carbs), in other words, by self-control. Wow. So do we. We have eaten a very strict LCHF diet for a year and half. I was just asking if anyone has used these supplements with good results. Go to http://www.lifeextension.com. They offer a variety of blood tests that you pay for directly. No doctors, no insurance. This is what we do now. We have lost our faith in the medical system. The medical complex only wants to ensure our demise. We refuse to let them. We believe in vitamin/mineral supplementation and have done our research. What Dr. Fung states about vitamins/minerals is so out there…We will stick to our supplementation as we do our IF. What about people with the MTHFR genotype polymorphisms C677T and A1298 who are adversely affected by folic acid? Supposedly 15-20% of the population has these polymorphisms. Was the B vitamin supplementation referenced in the research above done with natural folate or with synthetic folic acid? Does anybody know? And if any folic acid was used, wouldn’t that would adversely affect the results? Just askin’. Hi Karen – I agree with you and I replied to BobM above with the same thought. For most of my life I did not use supplements, but when I did they had the synthetic forms of B12 and folate. Because of my A1298C polymorphism those synthetic forms likely made me worse off. can someone explain why eating fat is good ? but won’t it still clog your arteries? Rose, arteries don’t get clogged by you consuming fat. That is an outdated model that does not align with modern research. Your arteries clog from consuming too much sugar, which leads to inflammation and repair of the arterial wall, which then scabs and causes blockages. It’s the sugar and refined carbs that cause clots that lead to heart disease, not saturated fat. On a diet of meat, eggs, fat, fermented foods, and greens, you do not have to take any supplement except vitamin D. Greens provide the Mg and K needed for fasting. Fermented foods have plenty of salt. So for osteoporosis how do you treat it without D, Calcium & Magnesium? Very different from the Wheat Belly way, which I have been following, together with IF, with some success. I tend toward the “less is more” approach, but WB’s Dr. Davis strongly recommends some supplements like Vitamin D, Iodine, Omega 3 fish oil, as well as magnesium, potassium, and good salt. 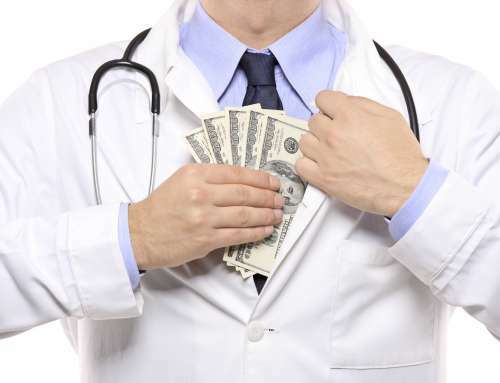 I respect both doctors – it’s so difficult to know what’s right. I don’t believe human beings were created to have nutritional requirements that depend on lab-created nutrients. That just doesn’t make any sense. Except when food now is low in phytonutrients because of modern farming practices what would be wrong with taking a daily multivitamin to boost nutrient levels up? I find I take vitamin B-6 every night because it helps stop the bottom of my feet get really itchy or burning feeling and taking B-6 stops the itching in 15 minutes. A friend told me that vitamin B-6 helps stop naurpothy. My husband is diabetic and has problems with naurpothy and taking B-6 really helps him. So I hope we don’t have any health problems. I think we often overlook the role of nutrients in nutrient. Spectracell has compiled a fantastic resource of research papers correlating nutrient deficiencies and common medical conditions (i.e. diabetes, overweight, ADHD, anxiety, asthma, autism, depression, dyslipidemia, estrogen, fatigue, infertility, fibromyalgia, hypertension, hypothyroidism, inflammation, insomnia, methylation). Makes for some fascinating reading. I get terrible leg cramps and started using SaltStick, which is an electrolyte supplement designed for athletes. They are supposed to be balanced and don’t contain mega doses. May want to discuss with your doctor given your medical history but I find it helped me with my leg cramps. This is my 5th day of intermittent fasting,16(20)/8(4). I am obese but not suffering any kind of defficiency of any vitamins as far as I know however I was not sure to take supplements or not during this period. This article helped a lot. John, what is the meaning of “16(20)/8(4)” I am curious about your fasting schedule. The late scientist Dr. Linus Pauling stated that heart disease was, in fact, a low level form of scurvy. So it makes sense to increase vitamin C in this scenario.